If you're lucky enough to live in a banana-growing climate, your farmers market or local store may well sell a variety of bananas. To those of you in less tropical climes, such variety seems like sheer madness and something to look for when you visit. What all bananas have in common is a fairly starchy texture, a mildly sweet flavor as compared to other tropical fruits, and the wonderful ability to keep ripening after they've been plucked from their trees. As tropical fruits, bananas don't care for the chill of the fridge, so it's best to store them at room temperature, where they'll continue to ripen gradually. If you want to speed things up, simply pop them in a paper bag. Have too many bananas to handle? Throw them in the freezer -- still in the peel, if you want. Their texture won't be great for straight eating, but frozen bananas transform smoothies to a milkshake-like thickness and are perfect for baking banana bread or banana muffins. Apple bananas are exceptionally sweet, hence their other name, Candy Apple Banana. They are grown in the rainy tropical forests in Hawaii. Their flesh is firm and has a slight pinkish tone. The sweet, moist fruit is perfect for snacking or using in desserts and is particularly well suited to adding to fruit salads and other raw preparations since it doesn't brown as quickly as other banana varieties. Cavendish bananas are the most common variety. They are the long yellow, slightly sweet bananas at supermarkets around the U.S. They go from under-ripe green to perfectly ripe and still firm mellow yellow, to riper deep yellow with a brown spot or two, to super soft and browning. The perfect ripeness depends on personal taste. Super ripe and browning bananas can be thrown in the fridge -- peel and all -- and peeled and used to make ​smoothies or banana bread. Williams bananas are the same as Giant Cavendish. They are large, mild, and sweet. Where they're grown, they're often sold green and underripe. Like all bananas, they continue to ripen after being picked. To hasten ripening, store them in a paper bag at room temperature. Lady's Finger bananas are smaller and sweeter than the ubiquitous longer, milder Cavendish. They can be used in the same way, but make particularly portion-controlled snacks, especially for kids. Pisang Raja bananas are popular in Indonesia, where they are often used to make banana fritters. They are also known as Musa Belle bananas. 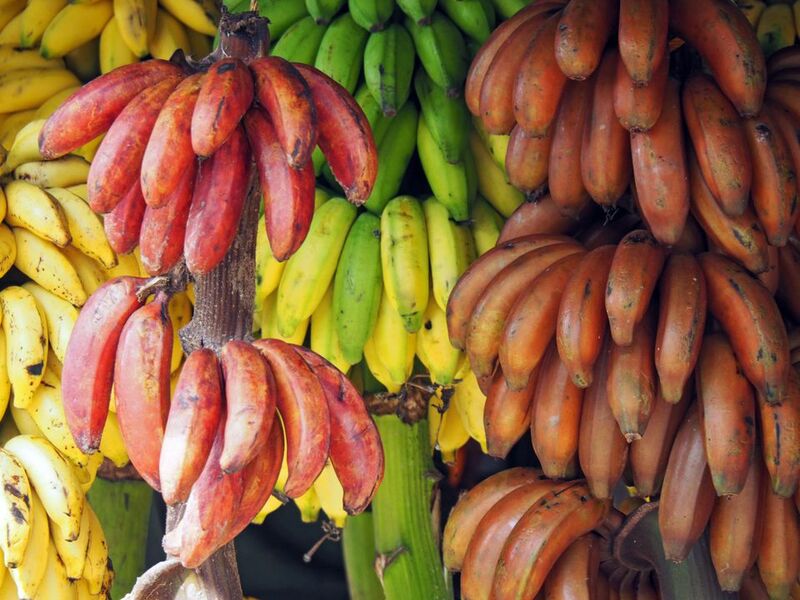 There are many types of red bananas, but they share two key things in common: they look super cool, and they tend to be on the sweeter side of the banana flavor family. Eat them out of hand or add them to dishes, but when they're red, they're ready to eat! Cooking bananas, like plantains, are better thought of as potatoes than as bananas. They can be roasted, steamed, fried into tasty chips, and otherwise used like any starchy vegetable. They are sold green, and many different types of bananas can be used as "cooking bananas" while they're still green and starchy.